Hi, I’m Nancy Elizabeth Munroe. 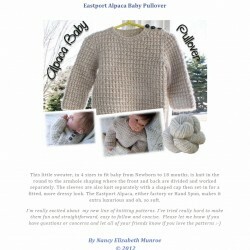 Nancy Elizabeth Designs is a small family owned business that I have created to keep me busy in my retirement. I work out of our Century Farmhouse in Prince Edward “The County” , a small island community on the Canadian Shore of Lake Ontario. The stunning beauty of the island, with its miles of sandy beaches, rocky outcrops and lighthouses has attracted many artisans while much of the land is still being used for agriculture. I can’t imagine living anywhere else on earth. The environment and people are a tremendous inspiration for the creative spirit. My primary goal, in the pursuit of my fiberart, is to share my passion for maintaining excellence, quality, beauty and joy in the process and practice of the craft. I want to honor the human skills involved, keep them from becoming a dying art and acknowledge the rich heritage, the diversity and multicultural history of handcrafted textiles. I try to stay mindful when sourcing my materials, thoughtfully choosing sustainable, natural and renewable resources. I love the notion of slowing down in order to have quality rather than quantity in life. The idea is that fashion should be less dependent on rapidly changing trends and colors (fast money for the rich) and more about quality, sustainability, and thoughtfulness in design and materials. The things we create we should make with care and there should be an expectation that they will have meaning to us. Herein lies great Joy in the creative process. My passion is discovering and playing with exotic natural fibers, lately Breed Specific and Rare Breed Wools, and finding creative ways to bring out the best qualities in each fiber or blend. I am also passionate about being friendly toward our Earth. I actually hug trees, buy organic and eat *real* food and want the things I make for you to be as Organic, Eco-Friendly and Natural as possible. I think I was born with my passion for natural fibers and all of the wonderful things that one can create with them. My Mom says I learned to knit at the age of 2 but in reality I think it was closer to 4 or 5 and by 7 years old I was choosing to spend my Saturdays listening to my record collection and ripping out any old sweater or unfinished projects I could find to provide yarn for my experiments while the other kids went outside to play hop-scotch. I learned everything I could from anyone willing to teach me. My excitement grew as I discovered crochet, weaving, spinning & dyeing, quilting and dressmaking. The natural progression was to study Fashion design with an emphasis on pattern making. We used to have an old suitcase where my Mother kept her knitting patterns, tools and yarns. I can still remember the way it smelled, the excitement of anticipation as I opened the old books to search for my next project. I remember the bone knitting needles and the extra fine real wool yarns. I remember my Mom’s gentle guidance and encouragement. She was always my most faithful and most enthusiastic supporter. 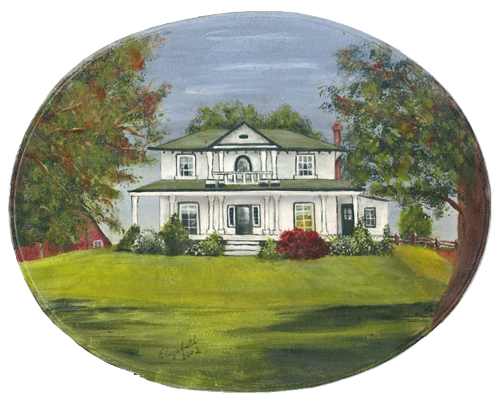 She’s an artist too, she painted our house in the picture above. Since I lost my Mom in November 2012 my knitting has become, more than ever, a dedication to her, a thank you for adding so much of value to my life. I often wonder as I pick up a lovely bit of fiber or another pair of knitting needles today if I do this, in part, because of the warm feelings it brings to me of nostalgia … of innocence … of hearthfires and family. As the years went by my projects and designs became more sophisticated and I learned more arts and crafts techniques. I learned to spin my own yarns as well as weave, quilt, sew and create my own designs and patterns. My number one passion is still knitting and it is always the classics, those lovely vintage designs, that draw me back to themselves time after time. 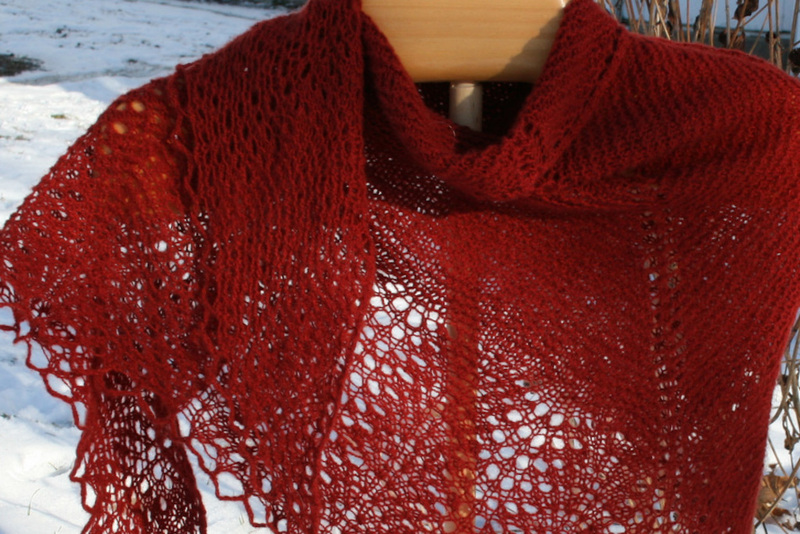 For many years, as a stay-at-home-mom, I had a little shop in the back of the house where I sold a few knitting and spinning supplies but mostly I sold my custom hand knit original designs as well as my handspun yarns. The love for and the practice of Fiber Arts has been a joy and a meditation to me throughout my life. 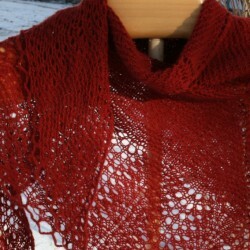 In the late 90s I built and managed an online yarn shop called Handknitting.com. It was a huge success but I wasn’t getting enough time for family or knitting so I made the heart wrenching decision to sell it to a couple who are doing all of the things I wanted to see happen with it and more. Just as we all have a story so does each and every one of my hand knit designs and every skein of Handspun Yarn. My many years of experience in knitting, spinning and running a yarn shop have helped me discover sources for the finest and most exotic and luxurious natural fibers and yarns from around the world. All of my handknits are lovingly and expertly hand knitted in the traditional fashion with great attention to detail and my handspun yarns are spun by hand in my own studio. Many of the natural fibers used in my designs have been imported from exotic locations but many are carefully chosen from local sources also. Most of the fibers are then carefully washed and prepared, lock by lock. The very first step in preparing a fiber is cleaning and this must be done very carefully to avoid any matting, or entanglement of the fibres. Most of them will then need to be carded or combed carefully and with patience and dexterity hand spun into a fine and well balanced yarn. A trendy and funky or bumpy yarn will look great for a season and can be fairly easily accomplished by a beginning spinner but for an heirloom quality handknit I prefer and carefully balanced hand spun yarn with a much higher degree of integrity and just enough variety in the thickness to give the finished design that very expensive high-end Handspun look. My goal is always a yarn or finished hand knitted design that will not only last for years and even generations but always be in fashion too. My Patterns are painstakingly designed to be simple and elegant with great attention to detail. They are classic and timeless designs which will always look great and be in fashion. Many with a Vintage / Retro feel to them. I love to study the history and traditions of knitting and prefer to use authentic and traditional methods and stitch patterns where applicable. I am knitting the Atherton sweater size 7. I finished shaping the hood and had 72 stitches and I did the neckband. I did the first set up row and ended up with 4 extra stitches. Am I doing something wrong or is there an error in the pattern. Thank you for your help. Hi Jo Ann, the yarn is priced by the ounce although a skein will probably be 2 oz or more if you order several. It also changes with the yarn weight. To see the prices of the various yarn weights please use the “yarn weight” drop down box. When you change this you will see the price change accordingly. Just a reminder that your pattern is a download. Nothing will be mailed to you. You can find the download link in any of these locations. 1) The completed order page that you go to after making your payment. 2) the email receipt that is sent out immediately when you make your purchase (check spam or junk if you don’t see the email), check the contents of the receipt for a link to your download. 3) you can log in to “my account” and find the link to your pattern download there. I have just begun Garter Stitch Baby Jacket. Thank you for making it available for free. 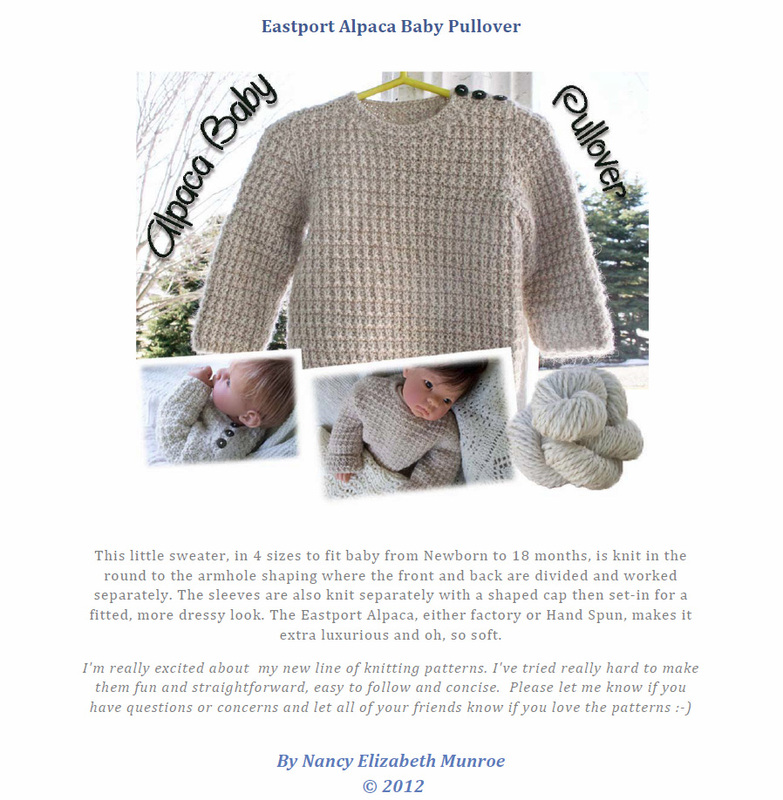 With a new grandbaby on its way and as a knitter for various charities it is a perfect pattern for me.